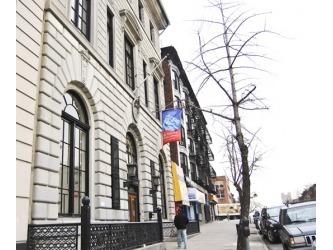 Hamilton Grange Public Library is a three-story building, located mid-block on the north side of West 145th Street. It contains two stories of book stacks and reading areas as well as an upper story that houses the library's administrative spaces and basement that holds a community meeting room. The first floor contains the adult collection and the entire second floor is dedicated to children. A recent renovation, completed in 2004, included redoing interiors, the creation of the community room in the basement, and the addition of an accessible front entrance. (NYPL press release). 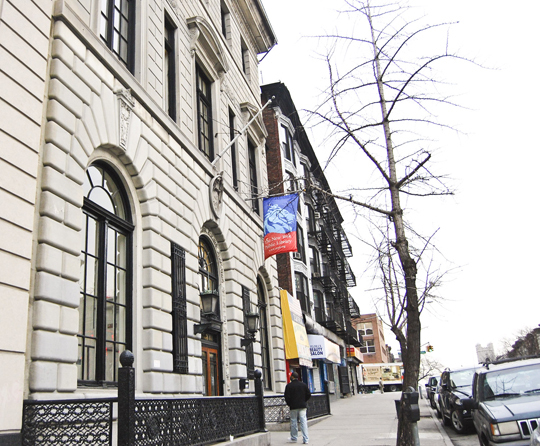 A few doors down the street from the library is the former PS 186, also known as the Snyder School. Designed by noted school architect C.B. Snyder, it was built in 1903, just a few years before the library opened. The library's close proximity to the school was likely intentional, so as to offer a study resource for pupils as well as a place for them to congregate after school. Although PS 186 is no longer in operation, a tradition of school children frequenting the library continues today. 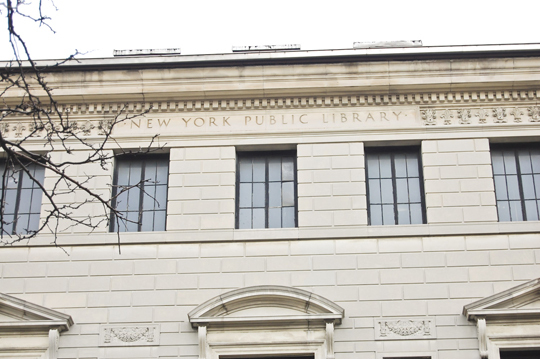 Andrew Carnegie had hoped for a library to be located in every neighborhood, but he did not dictate the style of building. "Carnegie provided the funds for these landmarks, but left book-club presidents, mayors, and big-city committees in charge of design. "(Jones, page 3) In a way, this was in-line with Carnegie's philosophy of self-motivation, hence the interest in the funding of libraries initially. "Libraries only helped those who would help themselves—the self motivated reader." (Jones, page 6). Carnegie believed that being wealthy came with a great responsibility, philanthropy. He therefore gave back to the people by providing a resource that could help to aid and educate those who were less fortunate than him in their desire to succeed. The Hamilton Grange Library was designed in the "Italian Renaissance" style--"a beautiful example of the grand style applied to a small building." (Landmarks). 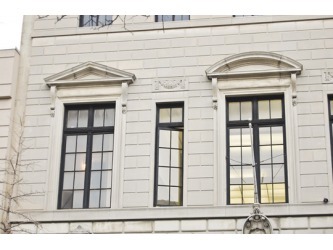 The building can be described as majestic with its light stone and simple ornamentation. 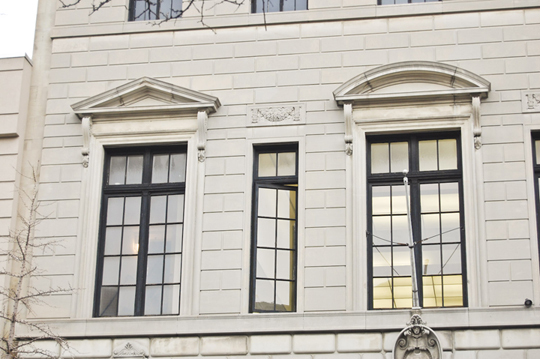 The Landmarks Preservation Commission, at a hearing on 31 March 1971, found the library to be "a supreme example of McKim, Mead and White’s adaptation of the Italian Renaissance style," and thus worth preserving and designating a landmark. 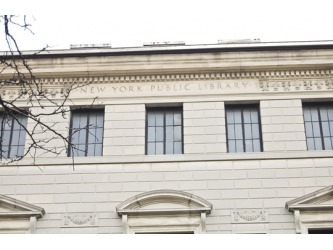 Unfortunately due to the financial crisis in New York City in the 1970s, "the library was forced to close all levels of the branch, except the first floor to save money. The branch reopened the second floor children’s room in 1981." (NYPL Press) After the 2004 renovation the reading and community areas of the branch have really become a welcoming and comforting place to be. Among the most notable architectural features in the Hamilton Grange Public Library are its high ceilings. In order to enhance the spacious quality, the walls, columns and ceilings are painted a clean, creamy white and are gently lit by large pendant lamps. In contrast, the dark, wooden shelves are packed with colorful books, magazines and DVDs. Coupled with the natural toned tile pattern on the floor, the color palette is warm and welcoming. On any given day of operation, the first floor of the library hums with the sound of people coming in and out. Some stop by for a video or to briefly use a computer, while others venture further inside the building where they can be found reading or studying. Up the stairs or elevator to the second floor, is the children’s area, similar in decoration to the first, but with miniature furniture, more talking and less people moving in and out. Under the helpful yet watchful eye of the librarians, children can study or participate in more playful activities that can include friends and parents.